When I was younger I used to go fishing for crawdads with the boy that lived across the street. He always said they were good eating. I never tested one out to confirm this statement; however when I moved to the South I found out there is a whole slew of people that think crawdads are quite tasty. Now we would usually look for crawdads in this partially underground tunnel that connected a retention pond to a small creek. One rainy day the water had risen significantly and we were trying to walk on the sides of the tunnel so we would not get swept up by the current. I saw a big crawdad float by me and I lunged for it! Of course I lost my footing and went for my first white water ride into the muddy creek. I never did catch that crawdad. Shortly after I sloshed my way home, dripping mud everywhere, and to my dismay was forever banned from catching crawdads in the tunnel. Apparently my mom thought I had better things to do with my time. Have you ever put your attention on something that didn’t really matter to you? Now the boy across the street was passionate about catching crawdads and in his 10 year old world that really may have been his calling for those days. 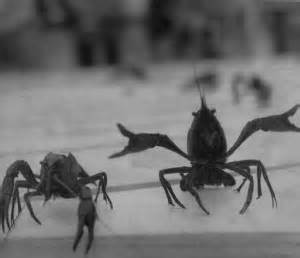 As for myself I was not so passionate about catching crawdads but I did find myself easily pulled into his excitement. For me it was the journey that led to something new. Even now I find myself looking for new adventures. Many times these adventures lead me away from the very thing I am truly passionate about. Many of us get caught up fishing for crawdads in our lives. We go out because it is something to do and that’s better than nothing. We settle for mediocre adventures or even the passions of others. We get so caught up in things that do not matter we soon find ourselves caught up in a current that takes us further from our dreams. Sometimes it is hard to figure out what is stealing our focus. We can only ask ourselves what is the value of what we are pursuing? Or we can ask if we are pursuing anything at all? When Jesus talks about the Kingdom of God He compares it to a great treasure that man finds. He buries this treasure in a field and then proceeds to spend all that he has to buy that field. How does seeking God’s Kingdom become more important than fishing for crawdads? I know that sounds like a ridiculous comparison but perhaps there is some truth to it. By developing a relationship with Jesus our desire to pursue Him and His Kingdom will grow. Many things in our life will try to distract us from this pursuit but as we evaluate what is important to us and what is important to God our focus will shift. Instead of living our lives drenched in mud with nothing to show for our efforts we can live a life that is full of joy and purpose. It is in Him that we live and move and breathe and have our being. Stop fishing for crawdads and above all else seek His Kingdom. This made me smile…..you & Jeremy were quite the adventuresome twosone. Yes! We definitely had a lot of fun!